It was not long ago that I reviewed the Really Right Stuff TVC-34/34L tripod and not long after that I needed an additional full-sized tripod. Based on my positive experience with the TVC-34, I added one to my personal kit. The longer I used it, the more I liked it and then a Really Right Stuff TVC-24L in 10-condition showed up in B&H's used department. I tried to resist, but... to no avail. I had the deal ready to share on the news page as I weakened. This model would be a perfect size fit between my Really Right Stuff TQC-14 and TVC-34 Tripods. Being the "L" (Long) model, it would be able to go higher than my other RRS models currently went. I had a RRS BH-40 tripod head sitting on the shelf and rationalized the deal so well that I couldn't resist adding another awesome Really Right Stuff piece to the kit. There are seemingly thousands of different tripod models vying for a place in your kit. The tripod market has become a very crowded one, and discerning the good from the bad has become increasingly difficult. Unfortunately, most beginners start out buying a low quality tripod and this typically means buying a second tripod – if the first tripod does not turn the photographer off to tripod use altogether. Though increasingly difficult, selecting a good quality tripod is at least as important as it ever was. With the ultra-high resolution of the current generation of digital cameras, a steady camera is more important than ever. A tripod's purpose is to hold a camera (or sometimes something else). If a moving subject is being followed with the camera, the tripod's job is to take the weight burden from the photographer, but otherwise, holding a camera very still is nearly always the goal. There are a host of reasons a camera needs to be held still, but to get sharp images is a primary one. A still camera is also needed for multi-shot strategies including HDR and focus stacking. Photography, especially testing cameras and lenses, is my job and tripods are a crucial accessory for doing that job. They are perhaps too important to be considered an "accessory" and I'm on a continuous search for the new ultimate tripod. As with cameras, lenses and camera cases/backpacks, I'm of the belief that one cannot have too many quality tripods. Often two are needed at the same time, tripods are needed at different locations and having a variety of sizes and strengths available simply makes life better. Tripods come in all sizes, ranging from tiny tabletop models to super-high models that can require a tall step ladder to use. Along with a vast size differential, a large weight differential exists. You can carry the lightest tripods all day and barely recognize their presence while the heaviest will become burdensome in a short period of time. Strength and rigidity are often the balancing factor between size and weight. A heavy short tripod is likely much stronger and more-rigid than a super-light tall tripod. So, tripod selection involves finding a model that offers the right balance between dimensions and weight, along with the features it offers, for the specific need. Let's take a look at the Really Right Stuff TVC-24/24L Series 2 Carbon Fiber Tripod's measurements and specs. I am not familiar with any tripod load capacity rating laws in existence and how much faith we put in this number is related to how high we regard the source specifying it. Fortunately, I have "loads" of trust in Really Right Stuff. An oft-used rule of thumb for tripod load capacity is to exceed at least 2x the weight of the gear intended to be mounted on it. While a much heavier than stated capacity load can be placed on most quality-rated tripods, the amount of vibration experienced becomes too high. Don't underestimate the importance of vibration control as there are many causes of vibration including wind. Using this rule, the Really Right Stuff TVC-24/24L Series 2 Carbon Fiber Tripod can be expected useful for nearly 20 lb (9.07kg) loads, considerably more weight than most of us will be placing on this tripod. I'll provide more-specific gear capacity advice later in the review. The taller a tripod is, the more likely it will accommodate your eye-level height or even your eye-level height with one or more tripod legs positioned downhill below you. The latter is a frequent occurrence for outdoor photography as well as those shooting from stairways, etc. Remember that your tripod head and camera/lens tripod-mount-to-viewfinder heights add significantly to the tripod's height during use. I'm 6' (1.8m) and for me, the TVC-24 would be short for general purpose use. On the other hand, the TVC-24L extends the camera well over my head, allowing comfortable upward shooting from a standing position. While high is good, so is low. Getting the camera right down on the ground can be ideal for some compositions and also for table-top work. Without a center column and legs able to splay straight outward, this tripod goes very low. A tripod's folded length is of primary concern for packing. A smaller retracted tripod, regardless of its maximum height capability, consumes less space. This means it is easier to fit into luggage and it does not protrude as far above a backpack. The 24L's retracted length is rather short and the 34L's retracted length, though not that much longer, is modestly long. All other aspects being equal, lighter is better. All other aspects are not always equal and a compromise is always being made to achieve lighter weight. The farther/longer you have to carry a tripod, the more important light weight becomes. Weight does not matter much for studio-use tripods that are seldom carried for more than minute while multi-day backpackers live at the other end of the spectrum. Those flying need to comply with luggage weight restrictions and in this case, tripod weight becomes a strong consideration. Really Right Stuff's entire carbon fiber tripod lineup is all about light weight and both the 24 and 24L's weights are a pleasure to work with, especially compared to many alternatives. The chassis is a substantial part of the tripod and it puts a mark on the overall weight and width of the tripod. However, as a rule, the wider the chassis and the closer it is to a true triangle in shape (vs. a circle with leg pivots attached to the outside), the less able it is to flex and in turn, the more rigid it is. Thus, I'm interested in the chassis max width measurement. The 5.06" (2.00mm) measurement excludes hinged pieces, including the leg caps. This is a mid-sized number. While the diameter of the top plate (the area available for contact with a tripod head) may hint at the strength of the tripod's chassis, it more-directly ties into the base size of the head being attached, though often a differing-size head and base will fit fine together. Either way, the smaller diameter of the two could be a limiting factor for stability. In this case, the TVC-24/24L has a modestly-sized top plate that, unsurprisingly, matches up perfectly with the RRS BH-40 Ball Head. A tripod head with a base that exceeds the top plate dimensions can be used, but some of the width benefit (improved stability for example) will not be realized. Shown above are top views of the RRS TVC-34, TVC-24L and TQC-14 tripods, illustrating top plate size differences. All other aspects being equal, thicker leg sections will provide greater stability and lower vibrations, though leg wall thickness and construction details of course come heavily into play here. In general, you carry a tripod by the top leg section and very thick leg sections can become more difficult to control. The thickness of TVC-24/24L's top leg sections strike the ideal balance between comfort and control. Tripod manufacturers typically offer many different models and the model name often described how the model fits into the family. The TVC-24 model name breaks down as follows: T is for "T"ripod, V is for "V"ersa "C"olumn (as in versatility), 2 refers to Series "2" (typically on a 00-5 industry scale) and 4 indicates "4" sections per leg. Starting at the top of the tripod, we have the part that holds everything together. In addition to "chassis", this part is referred to as the "apex", "main casting", "spreader", "spider", "collar" and likely more terms I am not remembering at the moment. The chassis' size and strength are keys for the overall strength and rigidity of the tripod. Skimp here and nothing else matters. Skimping is not in RRS' playbook and the 24/24L's chassis is solidly-constructed of corrosion resistant, anodized CNC-machined aluminum. Especially when using a ball-style head (usually my primary tripod head choice), the level of the tripod is often not important. But, there are times when I need the tripod's top plate to be completely level. These times include when I'm using a gimbal head or want to create a panorama image using the tripod head's panning base. For those times, the Really Right Stuff TVC-24/24L Series 2 Carbon Fiber Tripod has a spirit/bubble level. Perhaps not immediately seeming important to you is the comfort of the tripod in your hand. I carry a tripod a lot and any sharp design features where the chassis meets the top of the legs, the natural carry location, meets not-well-padded parts of the hand. Thus, a smoothly-design leg to chassis transition can make a big difference in the pleasure of using a tripod. All of the RRS tripods I've used to date are among the best-available in this regard. The TVC24/24L chassis, leg cups (front and back) and transition between them are very rounded and smooth with aesthetic attractiveness also highly favorable. Most tripods offer a solid top plate, a height-adjustable vertical/center column or the option of either. 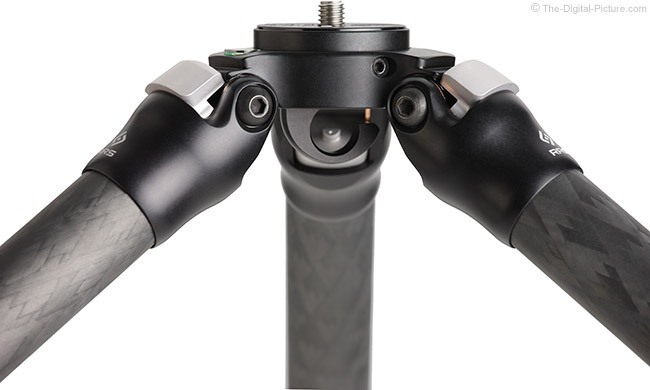 While a center column makes camera height adjustments quick and easy and with the center column able to rise well above the chassis, very high camera positions are enabled without impacting the tripods fully-retracted length. The huge disadvantage of a center column is significantly increased vibration experienced when the column is in a raised position, especially at full height where the difference in vibration dampening is dramatic. Another disadvantage is that the tripod's minimum height is limited by the length of the center column. When the center column is removeable, the choice is yours and you can change your mind frequently. With the Really Right Stuff TVC-24/24L and other RRS Versa series tripods featuring a set-screw-removeable CNC-machined aluminum top plate, an optional quick-column (the compatible TA-2-QC is 11"/28cm) and/or fast-leveling base can easily be added when desired. The top plate is substantially-sized and securely held in place by set screws (if the top plate comes loose, your camera is likely hitting the ground). Also substantially-sized is the CNC machined aluminum hook mounted under it. One exception to the carry-comfort of this model is that this hook can rest against the index finger of the hand grasping the one of the two legs without adequate clearance for that feature. Removing the hook eliminates that minor problem. The tripod head mount screw is reversible with 1/4"-20 & 3/8"-16 thread sizes that fit practically all tripod heads. Unless you are only going to use the tripod on a completely flat surface, typically a floor, you want a tripod model with independent leg spread. You want your DSLR tripod legs to open at various angles to accommodate whatever terrain you may encounter. For example, I captured this picture with two tripod legs fully extended at their tallest lock angle and the third leg was fully retracted and spread nearly horizontally to my left, balanced against a cliff. Models having independent leg spread angle stops around the leg pivot axles play an important role in the tripod's functionality. One of the primary tripod design observations to make is how strongly the leg angle stops meet into the stops provided on the chassis. Is the stop a weak little tab that protrudes from the chassis? The latter invites failure and it must be considered that this failure may result in your camera and lens hitting the ground. Also, does the weight distribution go straight into the leg through the leg cups? Or is there a vibration-inviting angle design being used? The Really Right Stuff TVC-24/24L Tripod features substantially-sized, smoothly-tapered, CNC-machined aluminum leg cups with also-significantly-sized angle locks and stops that, when all are locked in place, provide a very high strength setup with weight being directly transferred straight into the legs. This is a smart design that works great. Most tripod models offer multiple stop angles and the specific angles made available are seldom a strong differentiator between models. A differentiator is ratcheting locks that snap into the locked position when direction is reversed from outward to inward. Push from inside or pull from the outside to open a TVC-24/24L leg lock, open the leg just beyond the desired angle stop and reverse direction, or simply open the leg fully, and the angle lock gently snaps into the locked position and slides over narrower set positions as the leg is moved inward. Don't like the force required to spread the legs? Loosen or tighten the axle bolts with the included wrench. Brass bushings keep leg angle movements very smooth. Like the chassis, the legs are a critical part of a tripod. 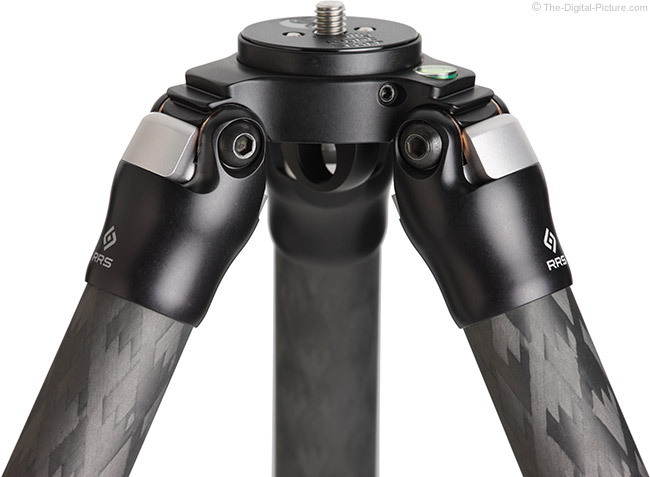 Perhaps the primary consideration for tripod legs is what they are constructed of, with aluminum and carbon fiber being the two most-common options. 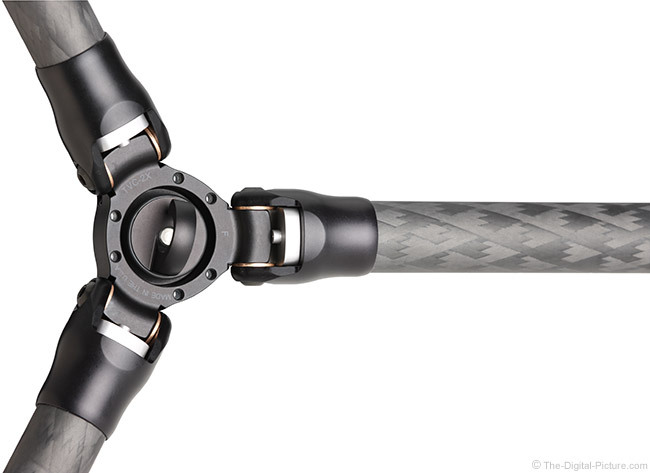 What are the advantages of a carbon fiber tripod? Carbon fiber models are typically lighter than equally-weight-rated aluminum models and that is often a primary consideration for photographers. But, a huge carbon fiber advantage is its ability to better dampen vibrations. Carbon fiber does not transfer heat as easily as aluminum and if using the tripod in cold temperatures, you will much-appreciate holding the carbon fiber model. Also for consideration is that carbon fiber is less susceptible to corrosion than aluminum – especially if used in/around salt water. What are the advantages of an aluminum tripod? Aluminum is a great material and its primary advantage in tripod form is low cost. Aluminum generally has a lower friction coefficient than carbon fiber, making it slide more easily for height adjustment. Aluminum dents and bends while carbon fiber breaks. Neither is good and the latter is less likely, but dented and/or bent may remain usable. Carbon fiber is my nearly-exclusive choice. Another important aspect to tripod selection is leg section length along with the number of sections per leg. Roughly, the number of leg sections times the length of the sections (minus some overlap and plus the chassis height) determines the maximum height of the tripod. Also, the length of sections is a strong factor in the minimum height and the folded length. Because there is one leg lock on each leg section joint, tripods with more leg sections have more locks and for that reason, they generally cost modestly more. Increasing the number of leg sections also slightly increases the set up and take-down time. With each leg section having a smaller diameter than the one above it, tripods with more leg sections generally have a narrower lower leg section than the equivalent tripod with fewer leg sections. General purpose tripods are most frequently offered in 3 or 4 leg section models and I generally choose 4-section legs for my primary tripods. Four leg sections give me a relatively-compact retracted size that is especially appreciated when traveling while offering a maximum height that works well for me. With quality-constructed tripod models, I don't find the stability of the thinner lower leg section to be an issue. 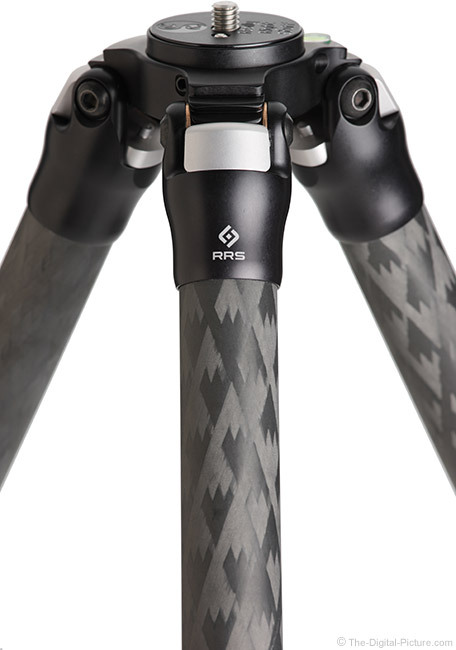 The Really Right Stuff TVC-24/24L Tripod features a patented carbon fiber weave that features great looks and an impressive strength-to-weight ratio. Most tripods have multiple legs sections, allowing them to be set up at various heights or retracted compactly. This means that leg section locks are needed and the first choice is typically between lever/flip-locks and twist locks. I've used both and much-prefer the twist locks. What are the downsides to flip-locks? These locks are spring-loaded and some can pinch your fingers (its painful). They are loud if not being very carefully closed (and closing slowing may lead to the first downside). The levers can catch on camera straps, backpack straps, branches, etc. And, I find the levers to be considerably slower to use. Twist locks, especially the short-rotation designs featured by RRS, are fast to use and fast can be very important. Some may argue that you only extend your tripod legs once when shooting and that speed is therefore not important and for some that may be the case. But, hopefully you do not walk up to a scene and automatically select full standing height, instead analyzing the scene and selecting the right camera height from a composition perspective. 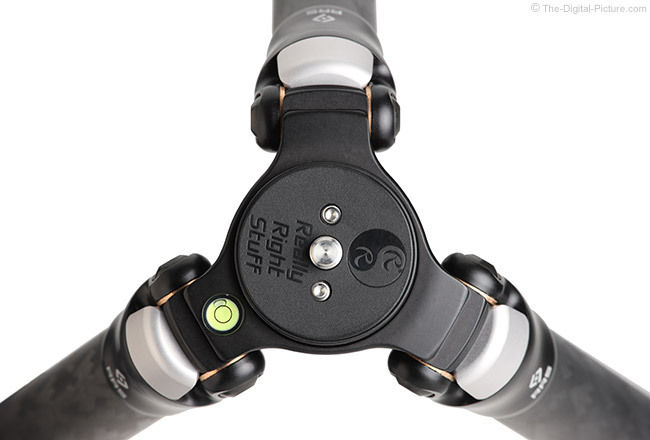 When retracted, all three of the Really Right Stuff TVC-24/24L Series 2 Carbon Fiber Tripod's legs extension locks on each leg can be simultaneously grasped and twisted 1/4 turn. Follow the three quick turns with a grasp of all three feet (or one at a time) and pull away from the chassis to simultaneously extend all the legs. Separate the legs slightly and give each leg lock the short turn that is needed to tighten it, working from bottom to top. Splay the legs and the tripod is ready to go (at full height). It takes only about 15 seconds. To fold a tripod, fold the three legs until they are vertical. While holding the top of one leg, use the other hand to loosen each leg lock 1/4 turn, starting with the top locks. 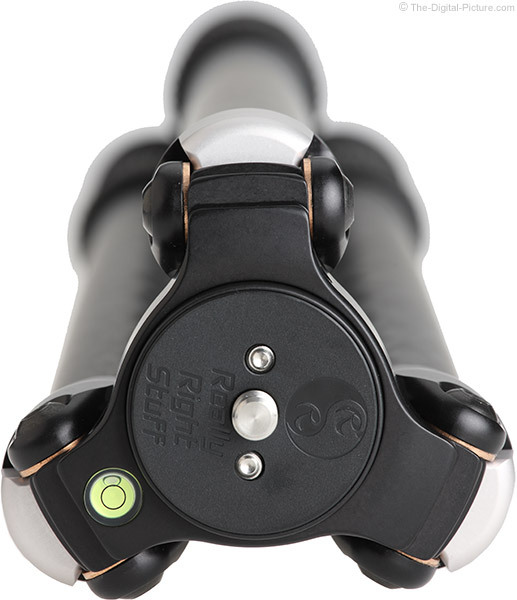 As the highest-positioned locks are loosened, allow the tripod to slide down to the next set. Continue loosening the locks until the tripod is fully retracted. Then simultaneously grasp and tighten all locks on each leg. Fold the legs completely and you are done. If not using the tripod at full height, conventional wisdom says that the lowest legs should be the most-retracted as they are the thinnest. 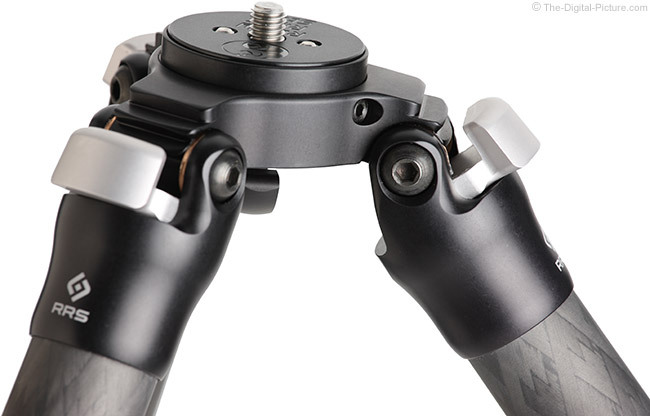 Quality tripods have very solid lower-leg sections and it is easier to reach the top leg extension locks to fine tune the height, so leaving the top section at least modestly retracted can make sense regardless of the lowest section's extension. If I want a less-than-fully-extended position, I generally hold the tripod head at the desired height and extend the legs in lowest-first sequence until I have the tripod secured at the desired height. While lever locks can be adjusted to hold solidly against leg section retraction, that often means a very tight lever and a very loud snap upon tightening (wildlife and quiet-venue photographers take note). Quality twist locks hold very tightly with only a moderately-strong, silent twist. Want to know how strong a tripod's leg locks are? Fully extend the legs, tighten the leg locks and, while keeping the legs together (not spread), pull straight down on the legs, gradually with significant weight. Note that exceeding the weight limit of a tripod could break it (I do so at my own risk), but quality leg locks will not retract under the pressure of my weight (170 lbs / 77 kg). The Really Right Stuff TVC-24/24L Tripod's leg extension locks make the grade, holding solidly under my full weight. To further test the strength of a tripod, also testing the chassis' strength, I fully extend the tripod legs, spread them to the first stop on a non-slippery surface and then hang from them. Again, exceeding the weight limit risks breaking the tripod (and there is a chance that I will hit the ground fast if that happens). But, I know that the Really Right Stuff TVC-24/24L Series 2 Carbon Fiber Tripod holds my weight, and I am now confident in loading expensive gear onto these legs. I am also comfortable recommending that you do the same. Supporting my weight may seem like an excessive requirement, but I often rely on my tripod to hold me personally. While not all photographers get themselves into the situations I get into, those of us who do need to rely on the tripod legs to support ourselves while navigating steep trails, stream banks, large rocks and other difficult terrain. Important to me is that the leg sections do not rotate when unlocked, allowing any individual leg lock to be tightened before the others. Most quality tripods made today support this feature and the Really Right Stuff TVC-24/24L Series 2 Carbon Fiber Tripod checks that box. Lateral rigidity is a primary responsibility for the leg section locks. Applying lateral pressure (but not too much as this is a breakage risk) to fully locked legs will quickly illuminate any play and/or flex that exists. Also, with modest pressure on the top plate, a tap to the middle of the extended leg will cause visible vibration. How quickly that vibration dissipates is the observation to make during this test. Relative to its weight, the RRS TVC-24/24L legs are quite rigid. They have some flex, but they are laterally strong and vibrations dissipate fast. Even when new, the legs extend smoothly in the locks and should be expected to extend very smoothly after some break-in. The tripod must rest on something and we logically call that something 'feet'. The RRS Versa series tripods' rubber feet feature a teardrop-shape that helps keep the legs off of the ground even when fully splayed. The 2 and 3 series Versa tripods share the same foot model. These feet are removable with spikes optionally available for solid anchoring in into the ground. 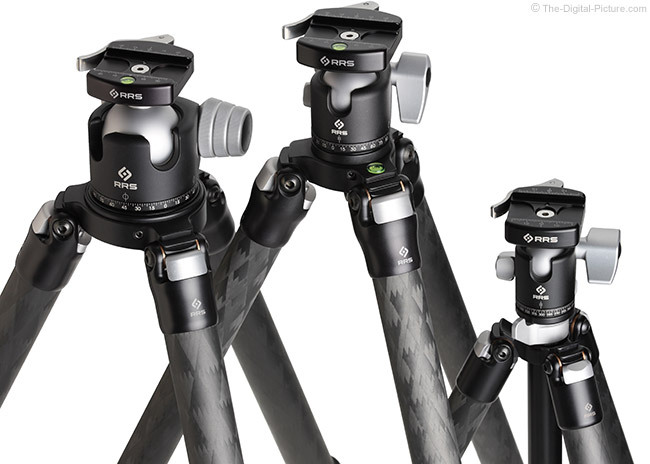 For their recommendations, RRS says "Versa Series 2 tripods are the perfect choice for mid-sized gear combos. Common mid-sized gear includes most DSLR cameras and 70-200mm/f2.8 & 300mm/f4 telephotos." I'm very comfortable with their advice and wouldn't hesitate to use at least a 400mm f/5.6 lens on this tripod fully extended and still longer focal lengths can be used. To gauge my comfort level, I used a Canon EOS 5Ds R mounted to a Canon EF 600mm f/4 L IS II and a Canon EF 100-400mm f/4.5-5.6L IS II lens. The lenses were mounted with a known solid ball head and with everything tightened. Weight-bearing was not a concern (it is rated to hold 40 lbs and it can hold me), but vibrations are usually the limiting factor. To create vibrations, the camera was firmly tapped with the view through the viewfinder then observed. With the legs fully extended, 600mm vibrations lasted about 4 seconds and wind or other causes of vibration could become a problem for 600mm use. With the tripod retracted, vibrations always settle out much faster and in this case, they are gone in about 2 seconds. At that rate, the TVC-24/24L is easily 600mm support-ready, though I still recommend stepping up to the Really Right Stuff TVC-34 Tripod for frequent 600mm use. With the 100-400 mounted and set to 400mm, vibrations dissipated in under a second even with the legs fully extended and nearly instant stability was seen at 100mm. While I don't expect this 2-Series tripod model to supplant use of my primary 3-Series model, it is a great option for when the 3-series model is not required and lighter weight matters. The right tripod head can make a huge difference in both your tripod use experience and in your results. Do not let your head be the limiting factor. The Really Right Stuff BH-40 Ball Head is a perfect choice. This head is size-matched to the TVC-24/24L and performs excellently. Above, the BH-40 is shown mounted on the TVC-24L with the BH-55 and TVC-34 combo to the left and the BH-30 and TQC-14 combo to the right. Cheap, low-quality tripods are usually a waste of money that will leave you disillusioned to what a tripod can do for you and will dissuade you from using it at all. Your time is valuable and researching the purchase of a tripod costs you in that regard. The cost of a tripod failing, either mechanical failure or failure to function at a satisfactory level, can be far higher and this results in having to invest the research time over again. Of course, paying for a replacement tripod is similarly inefficient. Buy right the first time and spend your time photographing. Using a high quality model will potentially greatly increase your image quality and it will be a pleasure to use and carry with you. I do not remember talking to a single photographer that wished they would have purchased a lower-grade model. No one is going to mistake the price of Really Right Stuff tripods with one of the cheap options. Quality has a cost and the price for quality must be paid up front. The good news is that this tripod should last a very long time and the value will be appreciated every time it is used. RRS offers a limited 5-yr warranty on the TVC-24/24L and I expect that this tripod will last a lifetime. Note that, while the RRS 2-Series models are less expensive than the 3-Series models, the difference is relatively small enough that it will not be a big differentiator in model selection for most. The Really Right Stuff TVC-24/24L Tripod used for this review was purchased retail/online. The bottom line? 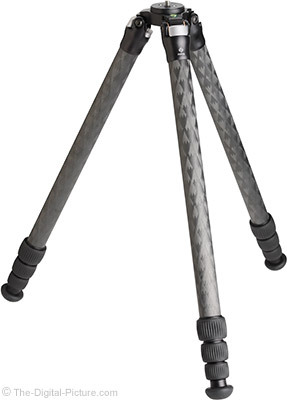 The Really Right Stuff TVC-24/24L Series 2 Carbon Fiber Tripod may be the finest mid-sized tripod in existence. If your budget can afford this model, you don't frequently need to mount huge lenses and don't otherwise need the rigidity of the 3-Series option, the TVC-24/24L is a great choice.